With their large leaves and good autumn colour, grapevines make an attractive garden feature as well as producing a worthwhile crop of tasty grapes that can be eaten fresh or used in winemaking. Height of cordon trained vine: 18m (6′). Spread of cordon trained vine: 15m (5′). Untrained plants may reach up to 8m (26′). Collection comprises 1 plant each of: Grape ‘Dornfelder’ – Good sized, blue-black grapes which ripen well in the UK and have one of the best flavours. Grape ‘Phoenix’ – When fully ripe, the fruit of this white grape variety have a light Muscat aroma and an excellent flavour. Estimated time to cropping once planted: 2 years. Estimated time to best yields: 3 years. Grape ‘Dornfelder’ – Good sized, blue-black grapes which ripen well in the UK and have one of the best flavours. 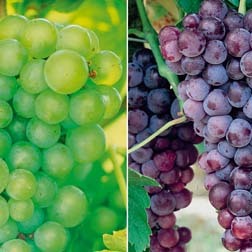 Grape ‘Phoenix’ – When fully ripe, the fruit of this white grape variety have a light Muscat aroma and an excellent flavour. 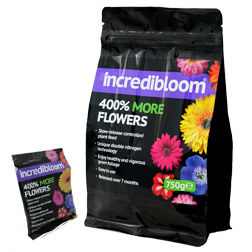 Incredibloom® is a ground-breaking innovation in premium fertilisers. 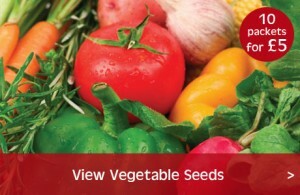 It guarantees that your plants will be fed the correct nutrients as and when they need them. The controlled slow release sets new standards in fertiliser quality thanks to its continuous delivery of nitrogen, phosphates and potash throughout the entire growing season of the plant. It acts fast because the controlled release of the nitrogen, the soil temperature and the moisture levels that govern the release of the nitrogen, all match the plant’s requirements. The unique double nitrogen technology means that there’s no waste, no burning and the fertiliser gives an immediate and long-term effect. The results of our trials really have demonstrated the benefits of using the right fertiliser and with such dramatic results, it’s a false economy not to add incredibloom® to your order. 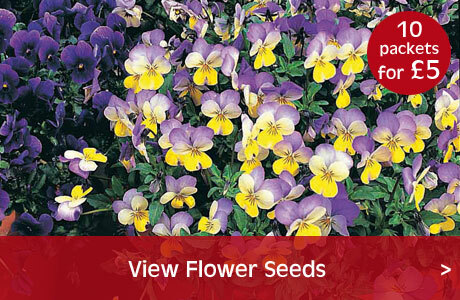 Remember, incredibloom® is a complete plant fertiliser with an excellent balance of NPK and trace elements. One easy application means that there’s no messing around with liquid feeds and no wastage as the plant only uses what it requires. Our best ever pink flowering strawberry putting taste and aroma at the front of the queue. 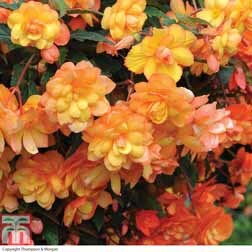 A compact plant producing masses of mid-pink flowers and up to 1kg of fruit per plant. 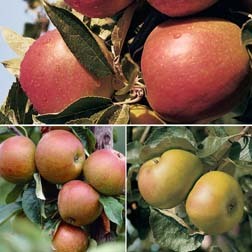 Early to fruit, it will keep cropping until the first hard frosts of Autumn. The key difference separating it from any strawberry currently available is its unique flavour. 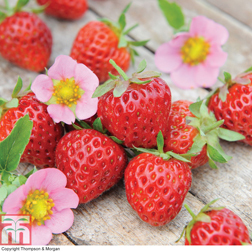 It combines the sweetness of more standard strawberries with the special taste of the wild woodland or alpine strawberry. Height 30cm, Spread 50cm. 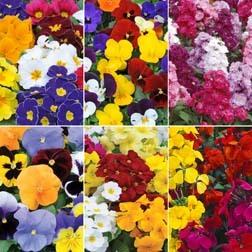 The easiest route to a colourful display of summer hanging baskets. These durable pre-planted baskets are delivered ready for immediate display. 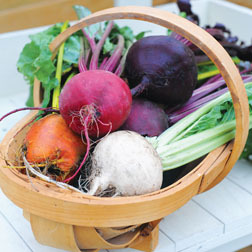 Our pre-planted Garden Ready baskets bring the colour up to eye level for easy enjoyment and easy upkeep. The number of plants in our baskets will depend on the variety you choose, but each basket, containing compost with plant food already added, is guaranteed to put on an impressive display right through summer. Simply hang-up, water, and enjoy their vibrant summer shades. 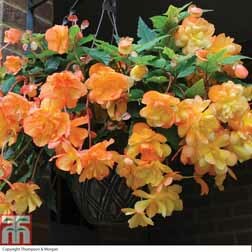 Hanging basket diameter 27cm (11in). Capacity: 7.6 litres. For hassle-free gardening this summer, look no further than our pre-planted pots for easy, no-fuss colour. What could be easier and more time saving than patio pots that have been planted up and hardened off for you, ready to place in your garden on delivery? Lovingly planted and established into compost that contains plant food already, so you don’t need to add your own fertiliser, these plants will perform better than ever. 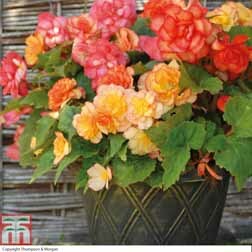 Plus you’ll be watering less as the durable pots are much larger than any of our competitors offerings. For a colourful garden display – simply order our pre-planted pots and put them where you’ll most enjoy their vibrant summer colour. Patio pot diameter 33cm (13in). 12.7 Litres. This Potato Growing Kit is the ultimate collection for all those who are passionate about their potatoes. Whether you are a keen gardener or a beginner, this collection compiles everything you’ll need. Kit will include the following items: 5 x Charlotte Potatoes tubers, 5 x 8lt Patio Planter Bag and 5 x packs of lucky dip Vegetable & Salad Seeds. Buy it now Please note that this offer expires at midnight on Sunday 1st January 2017. How about buying some rainbow coloured vegetable seeds? 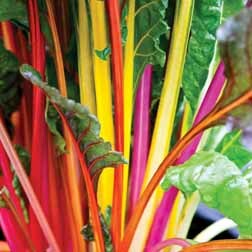 Your garden or veg plot could look absolutely amazing if you grew some of these fantastic multi-coloured vegetables. Visually stunning 5 variety beetroot mixture - the colours of the outer skins, sliced flesh and contrasting shades of stems and leaves are amazing! And so is the flavour. 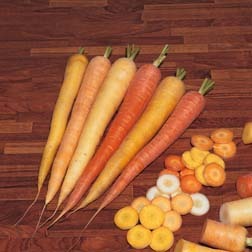 Just wash young roots, peel and slice raw into salads for tasty crunch and colour. 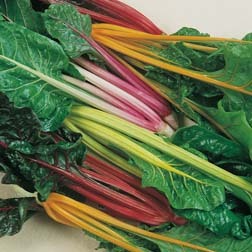 The tender stems and leaves make excellent salad ingredients too, or can be steamed and eaten like spinach or chard. ‘Baby’ roots are ideal for pickling, whilst mature roots can be steamed and enjoyed in a variety of dishes. Collection Includes: Subeto F1, Boldor, Chioggia, Albina vereduna and Bulls Blood Scarletta. 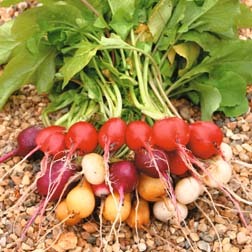 T&M has hand selected this visually stunning array of coloured skinned radishes all with crisp, white, delicious flesh. 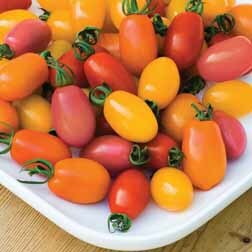 Radish Rainbow Mixed have round to plum shaped roots with white, purple, red, white and red, or a stunning gold skin, to add colour to your summer salads or sandwiches. Summer sowings grow quickly and will be ready to harvest in 28 days. A lovely idea – your own apple tree. 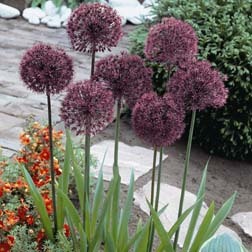 The name Onion might conjure up an image of a plain, brown sphere, but this ornamental plant is far from bland. Allium ‘Gladiator’ flowers once a season in the early summer. 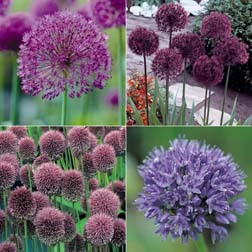 However, its large, orb-like heads made up of many purple blooms are sure to leave a lasting impression, not least because they transform into dramatic seedhead clusters in the late summer and autumn. The hardy bulb is an excellent, low maintenance addition to borders and cut flower gardens, for its blooms make a stunning centrepiece to any display. Height: 1.2m (4’0"); Spread: 15cm (6"). 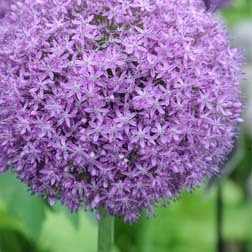 Its easy to see why this Allium is named ‘Globemaster’: its spectacular, spherical blooms, made up of dozens of lilac flowers, can grow up to 15cm (6") in diameter. Although they only appear once a season in June or July, the skeleton-like seedheads which follow are equally breathtaking. This beauty, along with Ornamental Onions’ undemanding nature, makes the hardy bulb well deserving of its RHS Award of Garden Merit (AGM). Height: 80cm (2’7"); Spread: 15cm (6"). Spectacular massive mauve globes. One of the best giant alliums - comes up reliably year after year. Bulb size 18/20. 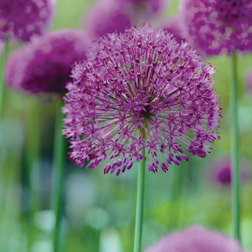 One of the best and most majestic Alliums for your late-spring garden, ‘Purple Sensation’ is a sun-loving, drought-tolerant variety producing spectacular lilac-purple flowers up to 15cm (6in) in diameter. Be sure to plant among other perennials that also have good structure. Height: 90cm. Spread: 30cm. Bulb size: 10/12. These magnificent allium bulbs produce an explosion of colour, followed by architectural seedheads that create a spectacular autumn display. 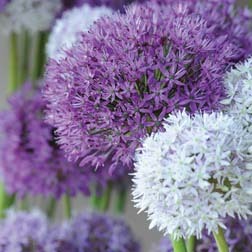 Undemanding and easy to grow, these magnificent allium flowers are also excellent for cutting. 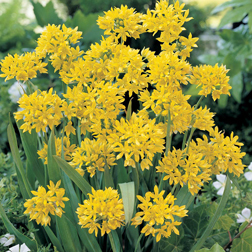 Easy-to-grow bulb for planting in drifts through borders, or dotted around in patio pots. The silver-sheened blooms neatly fi ll the ‘gap’ between spring and summer. Bulb size 1. 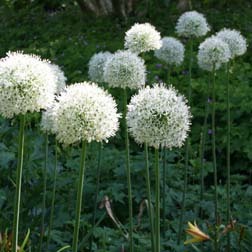 Just as the snow settles on top of Mount Everest, so this Ornamental Onion is crowned with large globes made up of pure white flowers in June and July. 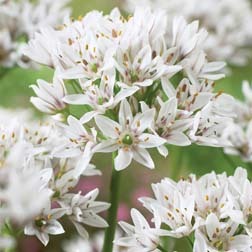 Allium stipitatum ‘Mount Everest’ is a hardy bulb that will produce stunning results with little maintenance, even in dry soil. Height: 1.2m (4’0"); Spread: 15cm (6").